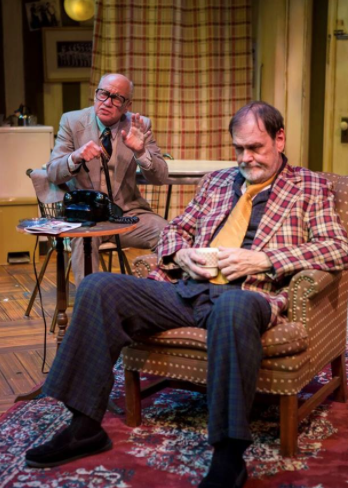 The New Jewish Theatre opens their season with a sure-fire Neil Simon script, “The Sunshine Boys.” And, no matter how they got there, John Contini and Peter Mayer make this play their own. Mr. Mayer went into the play on short notice and then, due to an illness, Bobby Miller had to drop out and, with just three days before opening, John Contini stepped in and we have a hit. Looking at a long-lost art- vaudeville- Simon waxes nostalgic but gives us a brief glimpse into what made this great American entertainment so popular for so many years. 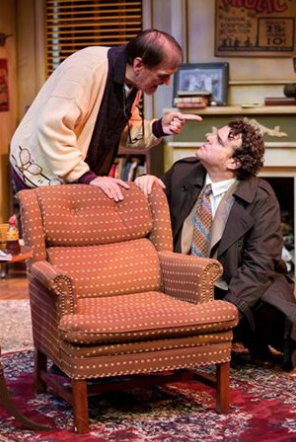 John Contini and Jared Sanz-Agero in “The Sunshine Boys” at New Jewish Theatre. finally reach the final dress before the live performance and almost come to blows. We quickly cut to after the show and find how friendships are resurrected and then lost again. yet so uncommingly good. This pair ranks among the best and, despite being local actors who have undoubtedly worked together over the years, have quickly found a bond over just a few rehearsals. Jared Sanz-Agero is stellar as Willie’s nephew who cares for him, brings him groceries and Variety every Wednesday and even eventually offers to open up his home to Willie when he can’t fend for himself anymore. His compassion and dedication to his uncle shines through. Fannie Belle-Lebby is hysterical as Willie’s visiting nurse and the trio of Julia Crump, Bob Harvey and Leo B. Ramsey provide humor as foils in the live TV rehearsal. 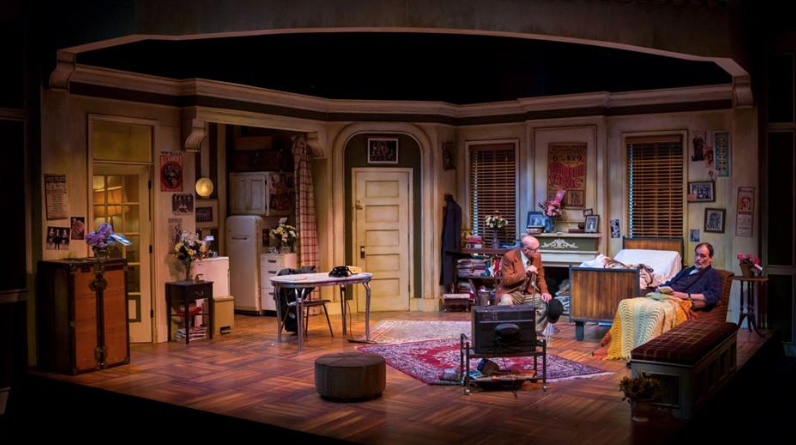 The beautiful Margery and Peter Spack set design with Peter Mayer and John Contini in “The Sunshine Boys” at New Jewish Theatre. Director Doug Finlayson leads the cast by the heartstrings. This is a funny, funny script coming from a man who started in the next big thing after vaudeville, early TV variety shows, Neil Simon. But it also mixes nostalgia with a keen sense of loss for this almost forgotten art form. It’s a remarkable work that truly gets better with each viewing. The lovely and poingnant set design is by Margery and Peter Spack with a great lighting design by Michael Sullivan and Michele Friedman Siler’s excellent costumes. In other words, New Jewish has once again delivered a total knock-out for their opening. Set in 1972, “The Sunshine Boys” was a love letter to vaudeville and it continues to remind us of that bright and shining moment of American entertainment that lives on in some forms today. It’s a fine play, lovingly recreated at New Jewish. Don’t miss out on this chance to see two icons of local theatre create two icons of vaudeville. 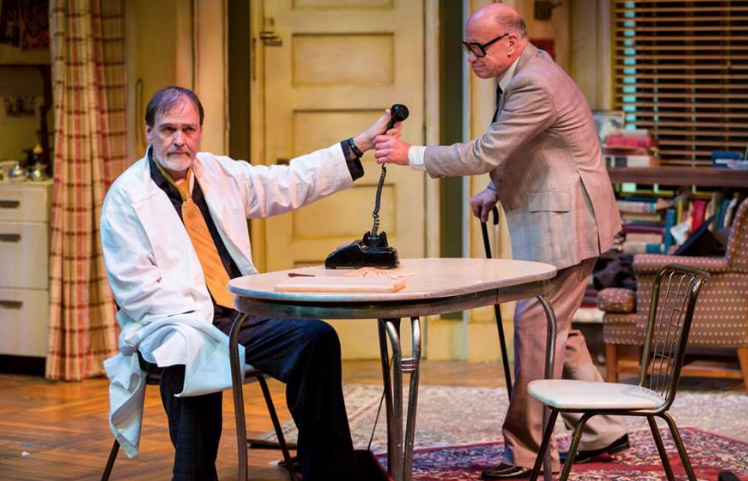 “The Sunshine Boys” plays at New Jewish Theatre through November 1st. This entry was posted on October 17, 2015 at 9:43 pm10 and is filed under Uncategorized. You can follow any responses to this entry through the RSS 2.0 feed. You can leave a response, or trackback from your own site.